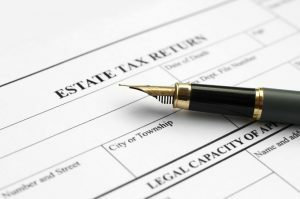 Client’s Guide to Estate Tax Planning – James F. Gulecas, P.A. You may have an unwanted beneficiary in your estate plan. It’s your Uncle Sam, and the IRS wants to make sure that he gets his share. Uncle Sam’s share of your estate is called the federal estate tax, and depending on the value of your estate and the year of your death, his share can be as much as 40% of your estate! If you own property jointly with a spouse, then one-half of the value of the property is included in your gross estate. If you own property as joint tenants with right of survivorship with anyone other than your spouse, then all of the property value is included except to the extent it can be proved that the other co-owner provided the funds to purchase the property. After totaling up your gross estate, the following deductions are made in order to arrive at your “taxable estate”: (1) debts that you owe at death, (2) administrative expenses (executor commissions, legal and accounting fees) incurred in administering your estate, (3) funeral expenses, (4) amounts left to charity (the “charitable deduction”), and (5) amounts left outright to your spouse or in a qualifying trust for your spouse’s benefit (the “marital deduction”). Because of the marital deduction, estate taxes are generally not payable in the case of married couples until the death of the surviving spouse. Under the Economic Growth and Tax Relief Reconciliation Act of 2001 (EGTRRA), as amended by the Taxpayer Relief Act (TRA) of 2012, the applicable exclusion amount was permanently set at $5,000,000 (to adjusted for inflation after 2011) and the estate tax rate for amounts over the exemption was set at 40%. With inflation adjustments, the applicable exclusion amount for 2017 was $5,490,000. The newly passed Tax Cuts and Jobs Act of 2017 preserves the estate tax at a 40% rate but increases the applicable exclusion amount to $11,180,000 in 2018, again with increases for inflation in future years. However, this increase only applies to individuals dying after December 31, 2017 and before January 1, 2026, when it will sunset along with most of the individual tax cuts in the Act. At that point, barring further legislation, the applicable exclusion amount will return to the 2012 Act permanent exemption of $5,000,000 plus inflation from 2011. We continue to believe that every single person and married couple whose expected gross estate exceeds $5,000,000 (which again, includes the proceeds of any life insurance) should be concerned about estate taxes and should plan accordingly. Here are some techniques that you can use to cut Uncle Sam out of your will. Step 1: Make maximum use of your “applicable exclusion amount.” With married couples, some planning is needed to ensure that the applicable exclusion amount of the first spouse to die is not wasted, which will happen if all assets are left outright to the surviving spouse. Typically this planning is accomplished by having a sufficient amount of assets on the death of the first spouse to die held in a Family Trust (also known as a “Bypass Trust,” a “Credit Shelter Trust” or a “B” Trust) of which the surviving spouse may serve as Trustee and from which the surviving spouse can receive distributions as necessary without having the trust assets be subject to estate taxes on the surviving spouse’s death. The Family Trust is generally set up under a Living Trust. Assets not used to fund the Family Trust may be left outright to your spouse or in a Marital Trust that qualifies for the estate tax marital deduction (also known as a “QTIP Trust” or an “A Trust”), under which the spouse will receive all of the trust income and can receive other distributions as necessary. Marital Trusts are very popular in second marriage situations where one spouse wants to ensure that the other is provided for during his or her lifetime, but wants to ensure that the surviving spouse cannot disinherit the children from the prior marriage. Marital Trusts are also useful if professional asset management is desired and to protect assets from any creditors of the surviving spouse. Note: TRA 2010, made permanent under TRA 2012, for the first time allows for the portability of a predeceasing spouse’s unused estate tax exemption to the surviving spouse, with the result that the surviving spouse’s estate tax exemption on his or her subsequent death will be whatever exemption applies at that time plus the predeceasing spouse’s unused estate tax exemption. There are restrictions and pitfalls to portability that should be fully understood before relying on it in your estate planning. Our client memorandum on portability is available here. Step 2: Remove the proceeds of your life insurance from your taxable estate by using an Irrevocable Life Insurance Trust. The proceeds of any life insurance policy on your life that you own at death will be subject to federal estate taxes under Internal Revenue Code 2042. This means that a person with a net worth less than the estate tax exemption amount has to worry about estate taxes if he or she owns substantial life insurance. By establishing an Irrevocable Life Insurance Trust and making the Trust both the owner and the beneficiary of the policy, these taxes can be avoided. There is a rule under which the proceeds will be subject to estate tax if you transfer an existing policy to a trust and die within three years of the transfer. This three-year rule does not apply if the trust is the original owner and beneficiary of the new policy. Also, this three-year rule may be avoided in some cases even with respect to transfers of existing policies using sophisticated techniques. If you are married and if your spouse is the beneficiary of your life insurance, the proceeds will not be subject to estate taxes upon your death (assuming your spouse survives you). However, any portion of the proceeds that your spouse does not spend or give away will be potentially subject to estate taxes upon his or her later death. Proper use of an Irrevocable Life Insurance Trust prevents this, and will also protect the proceeds from your spouse’s creditors. For a more detailed discussion of the use of Irrevocable Life Insurance Trusts, please read our Client’s Guide to Irrevocable Life Insurance Trusts. Step 3: Reduce your taxable estate by making annual gifts. You can give up to $15,000 each year to each of your children, grandchildren, or anyone else for that matter without reducing your applicable exclusion amount or incurring a gift tax. The number of potential recipients is limitless. In addition to making annual exclusion gifts, wealthier clients may wish to make larger gifts using their lifetime gift tax exemption ($11,180,000 in 2018), especially given the prospect of reduction of the estate and gift tax exemption in 2026 under the 2017 Tax Act. Many clients who want to make sure that their gifts are not frivolously spent by or subject to creditors of the gift recipients establish an Irrevocable Gift Trust. To read more about Irrevocable Gift Trusts and other gift mechanisms, please read our Client’s Guide to Gifts and Gift Trusts. Step 4: If Steps 1 through 3 aren’t enough, then further estate tax savings can be achieved through sophisticated estate planning techniques including Qualified Personal Residence Trusts (QPRT’s), Grantor Retained Annuity Trusts (GRAT’s), Installment Sales to Irrevocable Gift Trusts, Private Annuities, Self-Canceling Installment Notes, and other measures. Clients desiring to benefit charities as well as reduce estate taxes by means of the charitable deduction should consider charitable planning options, including private foundations, charitable remainder trusts, and charitable lead trusts, which are further discussed here. Planning Your Children’s Estates: Foresighted clients who want to maximize their children’s inheritances provide that upon the death of the surviving spouse, the maximum amount permitted under the tax law passes to a Dynasty Trust that will never be subject to federal estate taxes during its existence and can benefit children, grandchildren, great-grandchildren and so on for up to 360 years! The maximum amount that can be used to fund a Dynasty Trust in 2018 is $11,180,000 ($22,360,000 for married couples with proper planning). Dynasty Trusts are sometimes misleadingly called “Generation-Skipping Trusts” but the only thing skipped are the estate taxes, not the benefits of the inheritance! Your children can receive distributions from the Dynasty Trust, can serve as Trustee at such age and upon such conditions as you direct, and can have the ability to specify how the trust assets will be divided in the event of their deaths among their own children. Dynasty Trusts not only avoid future possible estate taxes, but along with other trusts you can set up for your children, provide other valuable benefits as well. Conclusion: Congress may not have succeeded in repealing the estate tax, but with proper planning, maybe you can!